The U.S. Supreme Court’s new term began earlier this month. The Justices have already agreed to consider several cases that could impact New Jersey municipalities. This post offers a brief preview. Redistricting: The Court will consider two cases regarding the redistricting process. After upholding Arizona’s use of an Independent Redistricting Commission (IRC) last term, the Supreme Court will now review the constitutionality of its newly drawn legislative districts in Harris v. Arizona Independent Redistricting Commission. The issues before the Court are two-fold: 1) whether the IRC violated the one-person, one-vote principle when it crafted uneven legislative districts, which enhanced minority voting ability but also diluted the vote of one political party’s voters; 2) whether the IRC may justify the creation of such uneven legislative districts by pointing to its desire to obtain preclearance from the U.S. Department of Justice Department, which had the authority to reject redistricting changes under Section 5 of the Voting Rights Act (VRA). The second issue is complicated by the fact that Arizona was required to obtain preclearance at the time the IRC crafted its redistricting map in 2011. But that is no longer the case after the Court’s decision in Shelby County v. Holder, __ U.S. ___, 133 S. Ct. 2612 (2013), which invalidated the formula – also known as Section 4 of the VRA – used to identify which States are subject to the preclearance requirement. Congress has not adopted a constitutionally-acceptable formula since. In Evenwel v. Abbott, the Court will determine whether the “one-person, one-vote” principle allows States to use total population, rather than eligible voter population, when apportioning state legislative districts. Out-of-State Lawsuits: In Franchise Tax Board of California v. Hyatt, the Court will address what happens when State governments are sued out-of-state. 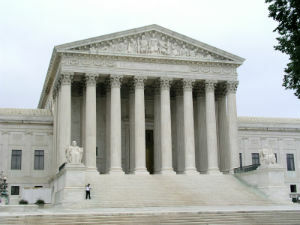 The Justices agreed to specifically consider the following issues: (1) whether the Full Faith and Credit Clause or principles of comity require Nevada to extend to sister States hauled into Nevada courts the same immunities Nevada enjoys in those courts; and (2) whether Nevada v. Hall, 440 U.S. 410 (1979), which permits a State to be hauled into the courts of another State without its consent, should be overruled. We will be closely tracking the status of the above cases, as well as any other public government cases that are added to the Court’s docket. We encourage you to check back regularly for updates and visit the Scarinci Hollenbeck Constitutional Law Reporter for in-depth coverage of the Supreme Court’s new term. For more information about any of the above cases, we encourage you to contact a member of Scarinci Hollenbeck’s Government Law Group.